I am experiencing a love/hate relationship with web-development. Around 5 years ago, I designed my first website. Mind you, it wasn’t my idea but I ended up doing it after my Maths teacher, and mentor, asked me to help design one for an NGO. He was teaching a web-design club which I immediately joined. I still remember my first tag which involved the ever welcomed “Hello World!”. Like any new hobby, it was wonderful and exciting at first. You learn about div’s, b‘s, i‘s (this was before strong and em) and it all seems rather, for a lack of a better term, obvious. If there ever was a constant in life, it is humanity underestimation of problems (maybe it’s Hofstadter’s Law in motion). After a week or so of html, I thought I had the hang of it. And then I encountered my first big problem, $php. There are two ways of looking for a solution and one’s approach can easily be used to deduce the relationship between one’s self and the task. First, one could go on a research binge which might include consulting, reading, observing other solutions etc. This usually implies one is willing to learn from the challenge and hopefully solve future similar problems. The second, and my less favourable approach, involves throwing the task to someone else. Unsurprisingly, the solution cycle usually involves a parts of both approaches. However, the best approach is try to stick with the former than the latter. When I first worked with php, I never wanted to try the first approach. If I ever have to introduce someone to programming, I promise to never bring them within 2 alt+tabs from php. Enough has been said about why php isn’t quite exactly the best tool (although there never really is a ‘best’ language) but it should be kept in the highest shelf until someone is knowledgeable enough. Think of it as the Jack Daniels of web-development (never bring it out on the first night!). To cut to the chase, I needed to design a forum of some sort but with confusing privileges. The website was a simple one but with one small problem; it wasn’t meant to be a forum. There is a web-analytic procedure that is simply known as the goal of a website. For blogs or news websites, we just want to have page views. The more the merrier. There are some variations in there but generally page count is the bottom line. For social networking sites, you need average time spent on the website (and some variations of it). The problem with the website like the one I worked on, is it had no particular goal or at least a way of measuring that goal. Would we need to create one username/password for the entire forum? Would we need to recreate an entire forum, with usernames and all the privileges associated, for a website that is used by less than 20 people? Surely email/social networks could have done a much more efficient job. After 2 weeks or so of learning php, I decided to request help from a Nordic kid who knew far more php than I could ever hope. After seeing his solutions, it suddenly hit me. I dove too deep too quickly. I had no idea what I was doing at this point. I’m working on an actual real life project that frightens me at the moment. At times I need to remind myself how to break the cognitive dissonance. It is challenging to know when exactly to flip the switch from thinking in one way to the other when you stare at the glowing back-light from the monitor. I recently spoke to a close acquaintance about his plans to expand his business. He had these grand ideas, more than what would be considered normal for a business of its size, and proceeded to ask me on specific information concerning particulars that I had had experience dealing with. At some point during the call, he mentioned that it is probably not a very good idea to keep planning and never quite successfully implementing the said plans. This was after an hour long phone call when he painted a rather beautiful picture of his future growth and was convinced, or he at least sounded so, that this golden path was the ultimate Eureka moment. It then hit me..
Once you really think about it, it makes sense. Our brains aren’t quite good and differentiating between ‘real’ and fantasy. It’s the reason why people can act convincingly by portraying emotions that aren’t driven by their current situation, hallucinate, become anxious and a whole lot of situations. William James suggested: “Everyone knows the difference between imagining a thing and believing in its existence, between supposing a proposition and acquiescing in its truth” (p. 283). To go back to my story, the person I was speaking to believed that his business was going in that direction. Scratch that, he believed that his organization was in that position by just thinking about the plans and throwing the ideas around. This wasn’t an unfamiliar feeling. Here is where brains become confused. It has been proven time3 and time again that brains ‘get off’ equally from fantasies in comparison to reality. It is not surprising that an hour long talk on fantasies is compared to a mental massage. Most of the time, these events feel real because someone else is sharing the same fantasy hence empowering the images further. Why are fantasies dangerous? They allow us to believe we achieved success here and now without fully comprehending the bigger picture. They distort the plan (expectations) into an incomplete picture. Even worse, fantasies can easily convince one that the goals have finally been achieved. In this study there were experiments consisting romantic crush, academic grades, and career choices, all measuring the effect between fantasies and expectations. In every single one of them expectations came out on top. Fantasies led to poor outcomes that resulted from low motivation. In other words, your brain mistakes you for having achieved the fantasy by just thinking about it. After all, it gets its fix cheaper and quicker that way. What happened to my acquaintance and his business plan? I still havent heard from him despite being reassured that the plan was flawless (and it genuinely sounded so). I think I’m due a data post. I’ve been searching for some relevant good looking data but I think this one’ll do for now. I fully do not agree going through with serious regression analysis because it will take me some precious hours (and will involve me working with STATA which I’m trying to avoid at the moment). Plus, people online like them some simple graphs. I’ll start with inflation. The current plight of sub-Saharan Africa is everything to do with price hikes. Below is a graph comparing inflation from around 1965 to 2012. 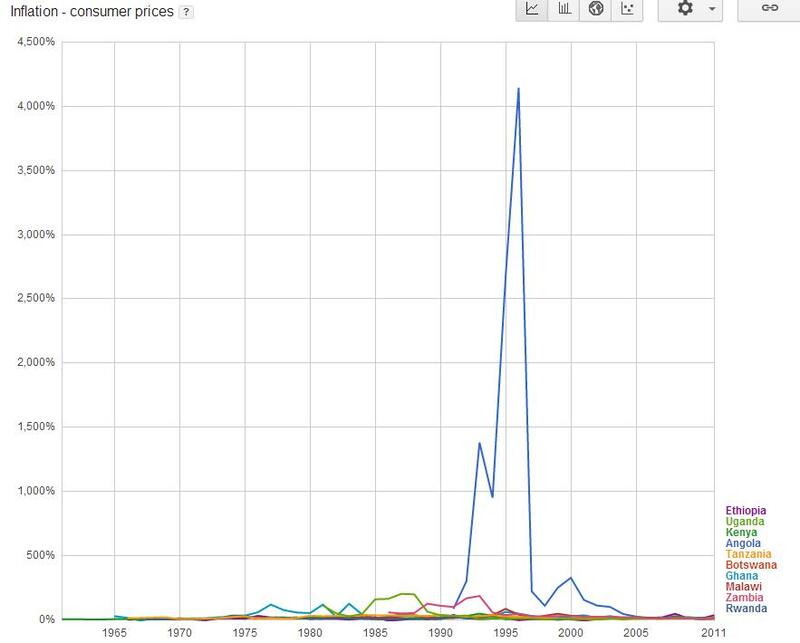 Angola had some major inflation in mid-90s compared to the rest of the countries. They all seem to behave after 2000. At least until you expand the graph to explore between 2005 and 2012. 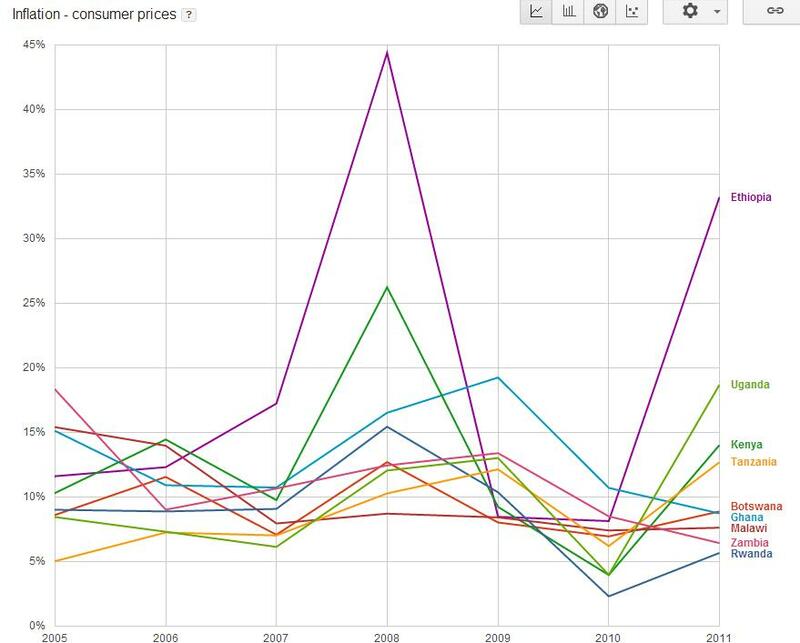 Ethiopia seems to be leading the race with around 30% inflation (this is bad!) while the East African crew (Kenya, Uganda & Tanzania) are following up close-by with inflation of between 10-20%. Notice however the slope of Ethiopia’s rise. Let’s take a look at the gender imbalance (hopefully the lack thereof) in the respective parliaments. Coming from a parent who studies Gender issues hopefully this will get me off the hot seat. 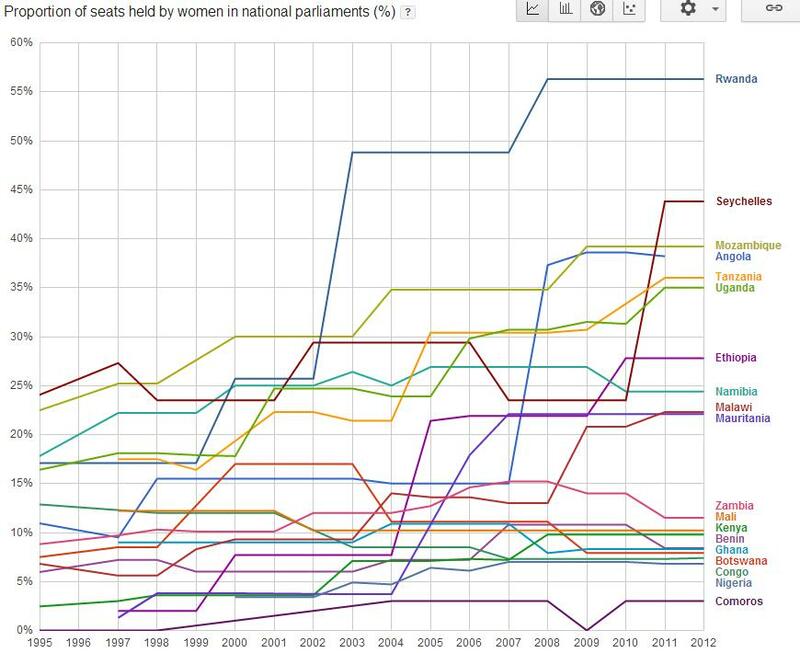 In general, gender equality seems to be on the rise (at least in terms of parliamentary seats). I found it surprising that Rwanda has around 55% of it’s parliament consisting of women. That’s pretty impressive. To those who know Rwanda, this isn’t surprising considering the amount of progress they’ve achieved in the last 15 or so years. It’s noteworthy to consider Nigeria’s position. I’m surprised they have such a high gender imbalance. It seems to have been under 10% from the beginning with no significant signs of improvement. I also had to consider the aid flow from around 2000. 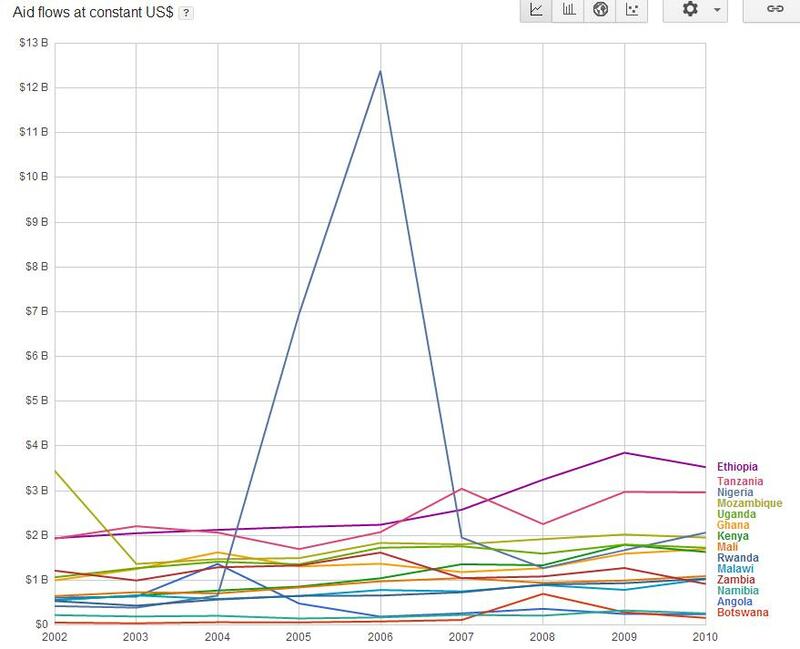 The massive spike you see below is Nigeria sudden massive increase in aid around mid 2000s with its consequent and similar decline. This next bit includes my favourite graph. It shows the relationship between external debt to gross national income. Total external debt is the sum of public, publicly guaranteed, and private nonguaranteed long-term debt, use of IMF credit, and short-term debt. Short-term debt includes all debt having an original maturity of one year or less and interest in arrears on long-term debt. GNI (formerly GNP) is the sum of value added by all resident producers plus any product taxes (less subsidies) not included in the valuation of output plus net receipts of primary income (compensation of employees and property income) from abroad. 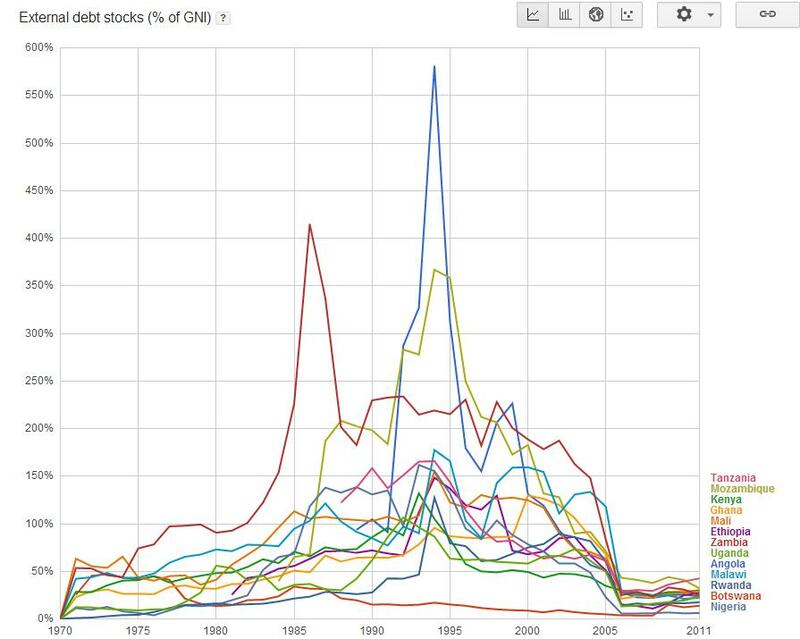 The graph is from 1970 to show the full picture of these countries’ journey through the debt burden. It’s not surprising that all countries had a sudden decrease in the ratio around mid 2000s. There was a debt forgiveness agreement during G8 summit in 2005. Finally, let’s see my least favourite graph. 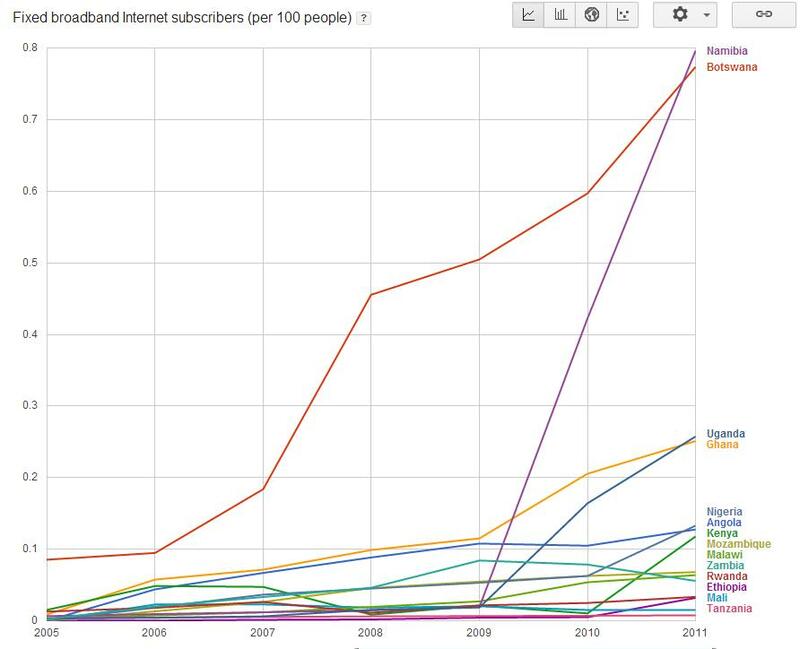 Internet subscribers for every 100 people would be a good way to see how far the technology spread has been so far. I chose to start from 2005 because all the countries before that had less than 0.1 subscribers per 100 people. While the countries involved have less than 1% of it’s population subscribed to the internet, Namibia and Botswana seem to separate themselves from the pack by showing an impressive spike. The rest seem to have somewhat of an increase but nothing deviating enough from the norm to attract attention. Except the dead last in the pack, never showing any improvement for nearly 10 years is Tanzania. No surprises there. Successfully functioning society with it’s diverse values, traditions and lifestyles requires us to have a relationship with our own reactions rather than be captive of them. To resist the our tendencies to make right and true that is which is merely familiar and wrong or false that which is only strange. I’ve been a bit lazy (surprise there!) posting my own material lately. Whether it’s because I’ve been busy or that I’ve been afraid of delivering a quality post is yet to be decided (my favourite excuse). I’ve been learning the API for Soundcloud and some jQuery. I hope to get that sorted out soon. Anyway, Lev Yilmaz is probably responsible for some interesting discussions I’ve had back in college. He’s an American animator/storyteller (or whatever we call those awesome youtubers who produce good videos) whose Dad is originally from Turkey (this is important to understand his videos). His videos come the closest to capturing the feeling of being a 20-something year old guy dealing with apathy and classic existentialism.